Burial*: Interment was in Shiloh Baptist Church Cemetery No. 1, Danielsville, Madison County, Georgia. Other Names*: John Lace Fortson, John Fortson. • His Find A Grave memorial, which includes a photo of his tombstone, is here. [S27] John Wright Boyd, A Family History: Lt. Thomas Fortson (1742-1824) and Some of His Descendants—Early Settler of Elbert County, Georgia (Danielsville, Ga.: Heritage Papers, 1973), pp. 151-52 (naming John Lacy Fortson as his father). [S961] Find A Grave, online at http://www.findagrave.com, memorial for John Lacy Fortson, memorial no. 146452165, viewed on 30 Nov 2017 (naming John Lacy Fortson as his father). [S27] John Wright Boyd, A Family History: Lt. Thomas Fortson, etc., above, pp. 151-52 (naming Sallie McConnell as his mother). [S961] Find A Grave, online, above, memorial for John Lacy Fortson, memorial no. 146452165, viewed on 30 Nov 2017 (naming Sallie McConnell as his mother). [S961] Find A Grave, online, above, memorial for John Lacy Fortson, memorial no. 146452165, viewed on 30 Nov 2017 (based on photograph of tombstone accompanying memorial). [S27] John Wright Boyd, A Family History: Lt. Thomas Fortson, etc., above, p. 152. [S961] Find A Grave, online, above, memorial for Betty Ruth Wallace Fortson, memorial no. 146452126, viewed on 30 Nov 2017 (not giving the date). [S961] Find A Grave, online, above, memorial for Betty Ruth Wallace Fortson, memorial no. 146452126, viewed on 30 Nov 2017 (based on obituary included in memorial). [S27] John Wright Boyd, A Family History: Lt. Thomas Fortson, etc., above, pp. 152-53 (naming John Lacy Fortson, Jr. as his father). [S961] Find A Grave, online, above, memorial for James Robert 'Bobby' Fortson, memorial no. 185542828, viewed on 30 Nov 2017 (naming John Lace [sic] Fortson, Jr. as his father). Other Names*: Betty Wallace Fortson, Betty Fortson. [S961] Find A Grave, online at http://www.findagrave.com, memorial for Betty Ruth Wallace Fortson, memorial no. 146452126, viewed on 30 Nov 2017 (based on obituary included in memorial). [S27] John Wright Boyd, A Family History: Lt. Thomas Fortson (1742-1824) and Some of His Descendants—Early Settler of Elbert County, Georgia (Danielsville, Ga.: Heritage Papers, 1973), p. 152. [S27] John Wright Boyd, A Family History: Lt. Thomas Fortson, etc., above, pp. 152-53 (naming Betty Wallace as his mother). [S961] Find A Grave, online, above, memorial for James Robert 'Bobby' Fortson, memorial no. 185542828, viewed on 30 Nov 2017 (naming Betty Ruth Wallace Fortson as his mother). Death*: He died on 22 January 2018 at age 52. [S27] John Wright Boyd, A Family History: Lt. Thomas Fortson (1742-1824) and Some of His Descendants—Early Settler of Elbert County, Georgia (Danielsville, Ga.: Heritage Papers, 1973), p. 152 (naming Robert E. Fortson as his father). [S27] John Wright Boyd, A Family History: Lt. Thomas Fortson, etc., above, p. 152 (naming Susie Mae Adams as his mother). [S961] Find A Grave, online at http://www.findagrave.com, memorial for Infant Son Fortson, memorial no. 64436568, viewed on 28 Dec 2012. [S27] John Wright Boyd, A Family History: Lt. Thomas Fortson (1742-1824) and Some of His Descendants—Early Settler of Elbert County, Georgia (Danielsville, Ga.: Heritage Papers, 1973), p. 152 (naming Grady Fortson as her father). [S27] John Wright Boyd, A Family History: Lt. Thomas Fortson, etc., above, p. 152 (naming Cumi Carey as her mother). • Find A Grave memorials for him are here and here. [S961] Find A Grave, online at http://www.findagrave.com, memorial for Eugene Talmadge Fortson, memorial no. 101882548, viewed on 28 Dec 2012. Other Names*: James Robert Fortson, James Fortson, Bobby Fortson. [S27] John Wright Boyd, A Family History: Lt. Thomas Fortson (1742-1824) and Some of His Descendants—Early Settler of Elbert County, Georgia (Danielsville, Ga.: Heritage Papers, 1973), pp. 152-53 (naming John Lacy Fortson, Jr. as his father). [S961] Find A Grave, online at http://www.findagrave.com, memorial for James Robert 'Bobby' Fortson, memorial no. 185542828, viewed on 30 Nov 2017 (naming John Lace [sic] Fortson, Jr. as his father). [S961] Find A Grave, online, above, memorial for James Robert 'Bobby' Fortson, memorial no. 185542828, viewed on 30 Nov 2017 (based on obituary included in memorial). [S961] Find A Grave, online, above, memorial for James Robert 'Bobby' Fortson, memorial no. 185542828, viewed on 30 Nov 2017. [S27] John Wright Boyd, A Family History: Lt. Thomas Fortson (1742-1824) and Some of His Descendants—Early Settler of Elbert County, Georgia (Danielsville, Ga.: Heritage Papers, 1973), p. 146. [S27] John Wright Boyd, A Family History: Lt. Thomas Fortson, etc., above, p. 146 (naming Joe H. Self as her father). 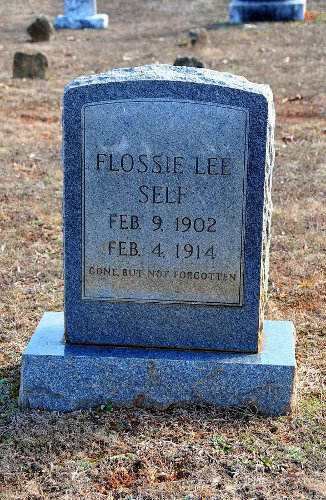 Flossie Lee Self's tombstone, Shiloh Baptist Church Cemetery, Shiloh, Ga., courtesy of Ed Saye. [S27] John Wright Boyd, A Family History: Lt. Thomas Fortson (1742-1824) and Some of His Descendants—Early Settler of Elbert County, Georgia (Danielsville, Ga.: Heritage Papers, 1973), p. 146 (naming Joe H. Self as her father). [S27] John Wright Boyd, A Family History: Lt. Thomas Fortson, etc., above, p. 146 (naming Cora Fortson as her mother). [S27] John Wright Boyd, A Family History: Lt. Thomas Fortson, etc., above, p. 146. [S961] Find A Grave, online at http://www.findagrave.com, memorial for Flossie Lee Self, memorial no. 64436844, viewed on 11 Jan 2013. Naomi Chatham Fortson's tombstone, Shiloh Baptist Church Cemetery, Shiloh, Ga., courtesy of Ed Saye. [S27] John Wright Boyd, A Family History: Lt. Thomas Fortson (1742-1824) and Some of His Descendants—Early Settler of Elbert County, Georgia (Danielsville, Ga.: Heritage Papers, 1973), p. 147. 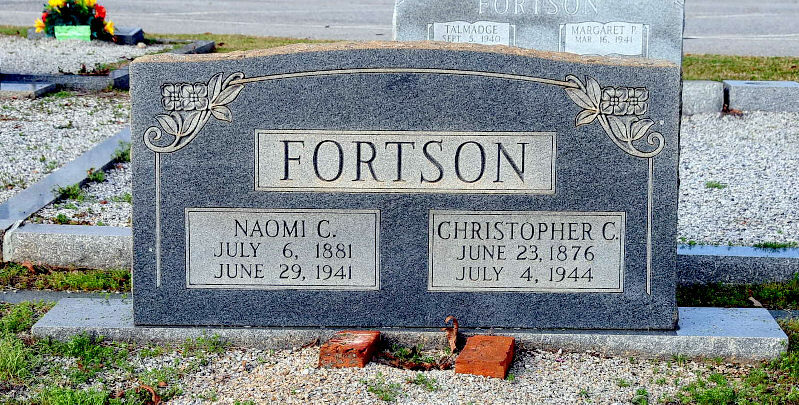 [S961] Find A Grave, online at http://www.findagrave.com, memorial for Naomi C. Fortson, memorial no. 45127103, viewed on 11 Jan 2013. [S27] John Wright Boyd, A Family History: Lt. Thomas Fortson, etc., above, p. 147 (naming Naomi Chatham as his mother). [S27] John Wright Boyd, A Family History: Lt. Thomas Fortson, etc., above, p. 147 (naming Naomi Chatham as her mother). [S27] John Wright Boyd, A Family History: Lt. Thomas Fortson (1742-1824) and Some of His Descendants—Early Settler of Elbert County, Georgia (Danielsville, Ga.: Heritage Papers, 1973), p. 147 (naming Columbus ('Lump') Fortson as his father). [S27] John Wright Boyd, A Family History: Lt. Thomas Fortson, etc., above, p. 147. [S27] John Wright Boyd, A Family History: Lt. Thomas Fortson, etc., above, p. 147 (naming Thomas Ed Fortson as his father). Other Names*: Lois McConnell Fortson, Lois Fortson. [S27] John Wright Boyd, A Family History: Lt. Thomas Fortson (1742-1824) and Some of His Descendants—Early Settler of Elbert County, Georgia (Danielsville, Ga.: Heritage Papers, 1973), p. 147 (naming Francis Newton McConnell as her father). [S27] John Wright Boyd, A Family History: Lt. Thomas Fortson, etc., above, p. 147 (naming Mary Graham as her mother). [S312] Social Security Death Index, online at http://tinyurl.com/AncestrySSDI, Lois M. Fortson, viewed on 11 Jan 2013. [S312] Social Security Death Index, online at http://tinyurl.com/AncestrySSDI, Lois M. Fortson, viewed on 11 Jan 2013 (stating that she died in Oct 1989; not naming the place of death but stating that she lived in Colbert, Ga. when she died). [S27] John Wright Boyd, A Family History: Lt. Thomas Fortson, etc., above, p. 147 (naming Lois McConnell as his mother). [S961] Find A Grave, online at http://www.findagrave.com, memorial for Francis N. McConnell, memorial no. 89462266, viewed on 11 Jan 2013. [S961] Find A Grave, online, above, memorial for Mary E. McConnell, memorial no. 89462267, viewed on 11 Jan 2013 (citing inscription on grave marker that she was the wife of Francis N. McConnell). [S961] Find A Grave, online, above, memorial for Francis N. McConnell, memorial no. 89462266, viewed on 11 Jan 2013 (citing inscription on grave marker that he was the husband of Mary E. McConnell). [S27] John Wright Boyd, A Family History: Lt. Thomas Fortson, etc., above, p. 147 (naming Francis Newton McConnell as her father). Other Names*: Mary Graham McConnell, Mary McConnell. [S961] Find A Grave, online at http://www.findagrave.com, memorial for Mary E. McConnell, memorial no. 89462267, viewed on 11 Jan 2013. [S27] John Wright Boyd, A Family History: Lt. Thomas Fortson (1742-1824) and Some of His Descendants—Early Settler of Elbert County, Georgia (Danielsville, Ga.: Heritage Papers, 1973), p. 147 (naming Mary Graham as her mother). [S27] John Wright Boyd, A Family History: Lt. Thomas Fortson (1742-1824) and Some of His Descendants—Early Settler of Elbert County, Georgia (Danielsville, Ga.: Heritage Papers, 1973), p. 147 (naming Columbus ('Lump') Fortson as her father). [S961] Find A Grave, online at http://www.findagrave.com, memorial for Mattie Lou Bryant, memorial no. 31118101, viewed on 11 Jan 2013. [S312] Social Security Death Index, online at http://tinyurl.com/AncestrySSDI, Mattie L. Bryant, viewed on 11 Jan 2013. [S961] Find A Grave, online, above, memorial for George W. Bryant, memorial no. 31118098, viewed on 11 Jan 2013. [S27] John Wright Boyd, A Family History: Lt. Thomas Fortson (1742-1824) and Some of His Descendants—Early Settler of Elbert County, Georgia (Danielsville, Ga.: Heritage Papers, 1973), pp. 147, 156 (both naming Martha Jane Fortson as his mother). [S27] John Wright Boyd, A Family History: Lt. Thomas Fortson, etc., above, pp. 147, 156 (both naming Ben Bryant as his father). [S961] Find A Grave, online at http://www.findagrave.com, memorial for George W. Bryant, memorial no. 31118098, viewed on 11 Jan 2013. [S312] Social Security Death Index, online at http://tinyurl.com/AncestrySSDI, George Bryant, viewed on 11 Jan 2013. [S961] Find A Grave, online, above, memorial for Mattie Lou Bryant, memorial no. 31118101, viewed on 11 Jan 2013. [S312] Social Security Death Index, online at http://tinyurl.com/AncestrySSDI, George Bryant, viewed on 11 Jan 2013 (stating that he died in Aug 1978; not naming the place of death but stating that he lived in Oneonta, Ala. when he died). [S312] Social Security Death Index, online at http://tinyurl.com/AncestrySSDI, James C. Fortson, viewed on 11 Jan 2013 (giving the date but not the place). [S312] Social Security Death Index, online at http://tinyurl.com/AncestrySSDI, James C. Fortson, viewed on 11 Jan 2013 (stating that he died on 8 Oct 1987; not naming the place of death but stating that he lived in Athens, Ga. when he died). [S27] John Wright Boyd, A Family History: Lt. Thomas Fortson, etc., above, p. 147 (naming James Clifford Fortson as her father). Other Names*: Annie Suddeth, Annie Sue Suddeth Fortson, Annie Suddeth Fortson, Annie Sue Fortson, Annie Fortson. [S312] Social Security Death Index, online at http://tinyurl.com/AncestrySSDI, Annie Fortson, viewed on 11 Jan 2013 (giving the date but not the place). [S312] Social Security Death Index, online at http://tinyurl.com/AncestrySSDI, Annie Fortson, viewed on 11 Jan 2013 (stating that she died in Jul 1981; not naming the place of death but stating that she lived in Athens, Ga. when she died and that last benefits were sent to an address in Athens, Ga.). [S27] John Wright Boyd, A Family History: Lt. Thomas Fortson, etc., above, p. 147 (naming Annie Sue suddeth as her mother). Burial*: Interment was in Macedonia Church, Madison County, Georgia. [S27] John Wright Boyd, A Family History: Lt. Thomas Fortson (1742-1824) and Some of His Descendants—Early Settler of Elbert County, Georgia (Danielsville, Ga.: Heritage Papers, 1973), p. 147 (naming James Clifford Fortson as her father). [S312] Social Security Death Index, online at http://tinyurl.com/AncestrySSDI, Shellanna Kettle, viewed on 11 Jan 2013 (giving the date but not the place). [S312] Social Security Death Index, online at http://tinyurl.com/AncestrySSDI, Shellanna Kettle, viewed on 11 Jan 2013 (stating that she died on 1 Feb 1996; not naming the place of death but stating that she lived in Arnoldsville, Ga. when she died). [S312] Social Security Death Index, online at http://tinyurl.com/AncestrySSDI, Shellanna Kettle, viewed on 11 Jan 2013.